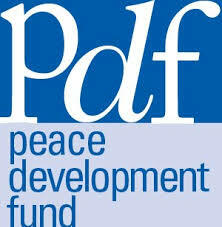 The Peace Development Fund (PDF) was founded in 1981 when a small group of donor activists came together with a common vision of funding social justice and peace through a public foundation. PDF was founded on the belief that lasting change will come only when a large amount of people are well informed and empowered to make change. PDF has always believed that true democratic change must take place from the bottom up. That change can only endure with citizens who are both informed and clear about what they believe. Throughout its history, PDF has always looked at peace as just not the absence of war or militarism, but as the presence of equitable relationships among people, nations, and the environment. This understanding of peace has allowed PDF to bring a social, environmental, and economic justice perspective to its work. Looking back over the last 30 years PDF has had a great number of successes. These successes make up the bedrock and foundation upon which PDF builds the next 30 years. We look forward to this next period of funding the grassroots movement in the United States and beyond.